Delicious rhubarb-cranberry-recipes are wonderful served with turkey and chicken at anytime. What would Christmas be without cranberries? This combination of flavorings works well together to even make a darn good cookie. 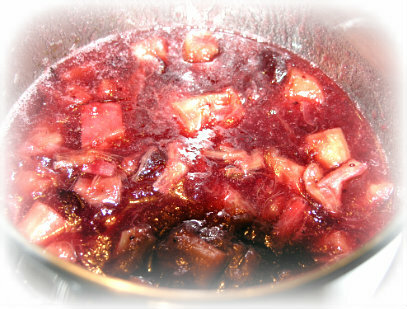 Mix the rhubarb,sugar,cranberry sauce and spices. Bring to a boil stirring occasionally. Add other fruits and rum. Simmer on low heat for 30 minutes. Refrigerate. Remove cinnamon sticks before serving. This is to be reheated and is wonderful served with turkey, chicken and duck. 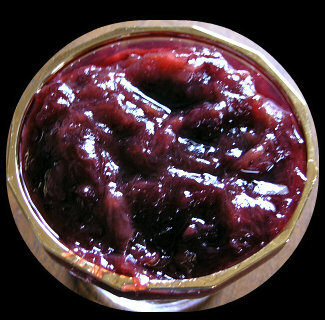 A compote recipe is wonderful also poured over any type of plain cake or ice-cream. Combine water and cranberries over medium heat. Wrap the spices in a bag and add to mixture. Cook for 10 minutes. Stir in the rhubarb, and continue until sugar has dissolved. Remove bag, and let cool. Refrigerate overnight and serve with turkey or chicken. Rhubarb-cranberry-recipes, especially compotes use many ingredients of "the season." 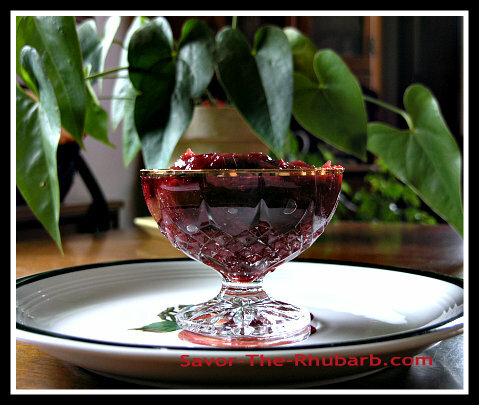 Rhubarb is a good substitute for cranberries if you don't have any. They are very similar in qualities. Read up on a little Cranberry Trivia and how it helps us just like rhubarb does. Gently mix the above ingredients and place in a greased 13" x 9" baking dish. Bake at 350F for 20 minutes. Mix the batter and drop by spoonfuls onto the filling. Return to the oven for approximately 45 minutes until filling is bubbling and batter has browned. This is a favorite of the rhubarb-cranberry-recipes. Make a sauce by combining the cranberry juice, 1/4 cup sugar and water. Bring to a boil for one minute. In the meantime, sprinkle first 2 cups of rhubarb in the bottom of a baking pan. Mix the biscuit mix, 2 tblsp. sugar, nutmeg, oil and milk together to make a dough. Roll out the dough, and coat the top with the butter. Spread with next 2 cups rhubarb and 3 tblsp. of sugar. Roll it up as you would a jelly roll, and slice into 8 or 9 pieces. Place (evenly spread layer) over chopped rhubarb that is already in the pan. Cover with cranberry sauce made earlier. Sprinkle with a bit of brown sugar and white sugar. Bake at 400 degrees for 30 minutes, and serve with ice cream on the side. Add the pears and apples and let simmer for 6 or 7 minutes. Add in bitters and cranberries and cook down for 3 minutes at medium heat. Stir occasionally and remove from heat - If you want more sugar, add another tablespoon of sugar and return to heat for a few minutes. Remove from heat, let cool and refrigerate. Serve alongside chicken or turkey. Very nice! Also nice over ice-cream or any plain pound cake. 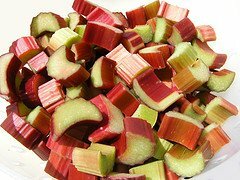 I hope you will enjoy these rhubarb-cranberry-recipes and that any one of them has added nicely to your Christmas menu.